Believe me, I tasted chocolate truffles only before 8 years. Until then, I didn't know about truffles and thanks to TH for giving me a chance to taste it. He gifted me a box of assorted truffles which were very good and I liked the mint flavored one a lot. I wanted to try the same version at home and looked over web. 1) Heat double cream along with butter in a small and heavy bottom sauce pan over medium heat. 2) When it is boiling, turn the flame off immediately and add chopped chocolate. Let it be for few minutes and stir it until it reaches smooth consistency. 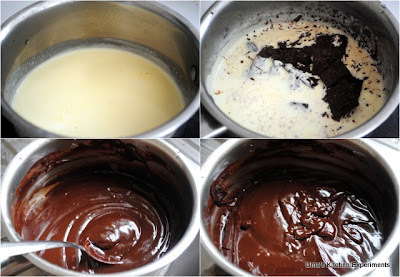 3) This cream and chocolate mixture is called as ganache. Pour this ganache to a bowl. Alternately, you can take chocolate in a bowl and pour boiling heavy cream into it and mix well to get ganache. 4) Keep this bowl in the refrigerator for 2 hours to 4 hours or till it becomes firm. This refrigeration time might vary based on the quality of the chocolate you use. 5) I kept for 4 hours. 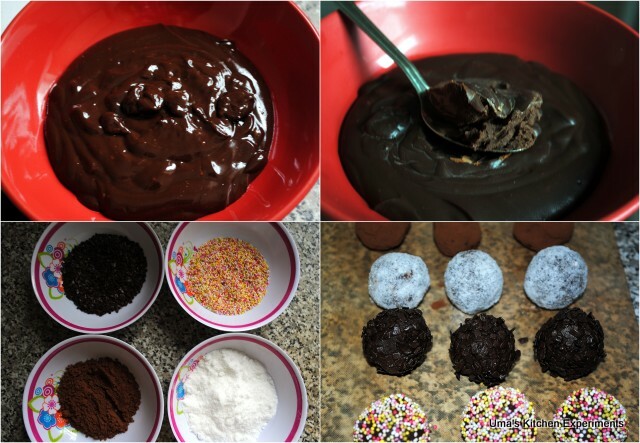 After 4 hours, scoop out the ganache using a tablespoon and roll to a ball immediately before it melts. 6) Coat these truffles in powdered sugar or cocoa powder or in chocolate chips. 7) Store again in a dry container or box and keep inside the fridge. Bring to room temperature when you serve. 1) Use high quality chocolate for best truffles. 2) Add vanilla or other flavors as per your liking to this truffles. 3) You can also use bittersweet chocolate for making these truffles. I personally don't like bittersweet one and I prepared using bittersweet chocolate once and coated with sugar 3 or 4 times to eat it. Super like, irresistible truffles, i dont mind gobbling some rite now.. Brilliant truffles.. bful clicks.. How do u find time with a lil one..
Wow these look super. Very creative. Nice pictures too. Very Delicious and super presentation. excellent clicks, truffles looks perfect..
Wow, these looks so good and appears to be simple to make. Very tempting, I prefer to gift these rather than commercial chocolates! a delight to look at Uma! i love those sprinkled truffles. I am chocolate lover. These pics made me drooling.